1) I just announced "Pi Jumper", it is designed to work with RoboPi. 2) I expect to release a new version of the RoboPi documentation, libraries and firmware next week, with several API extensions aimed at making gear motors and differential steering easier. 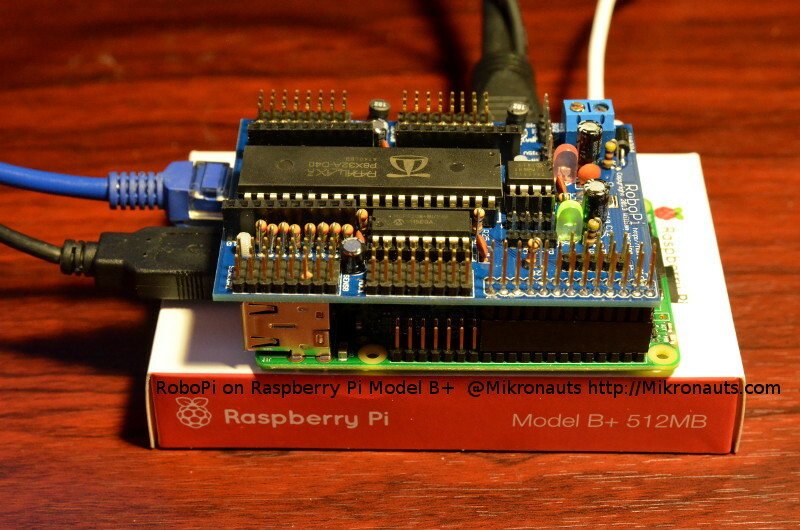 RoboPi works fine on a Raspberry Pi Model B+ !!! Python 3.2 support also works now, I am working on updating the user documentation for RoboPi with the Python library documentation. The next firmware release will include tested C demo files for the RoboPi API. I am updating the sample code in the manual today as I just finished testing the samples. I also added a "resetRoboPi" utility which wiggles GPIO#17 in case your code left a PWM or servo task running on RoboPi, this reboots RoboPi. The demos also cover RoboPiInit(), pinMode(), etc. I'll add a shell script or make file to compile the demos. I'll upload the new Python interfaces, sample code etc. shortly, the new user manual is up on the product page (so you can check out the Python API and the tested C sample code). For some strange reason the RPi.GPIO I installed does not seem to have a 'setmode' method, so resetRoboPi.py does not work yet. Python support is now available for RoboPi !!! I have started to work on the next revision of the RoboPi firmware and C/C++ & Python libraries. I am adding support for HMC6352 and HMC5883L based I2C compass modules. I don't see any point in supporting fractional degrees, the accuracy of these modules is really only about 2 degrees anyway. Just like with the B+ standoffs can be installed on the A+ that RoboPi can rest on to stop it from “flopping around”. I am sure the Compute Model would also work, however I have not had time to try it yet. If you have any questions, please do not hesitate to ask here! In order to help new users with getting RoboPi based robots running faster, the RoboPi Full and Lite kits now ship with an EEPROM containing the latest version of the firmware at the time of shipping - so once you build your kit, there is no need to program the EEPROM yourself! If you are interested in purchasing RoboPi, please search for RoboPi on Ebay, or contact me at mikronauts(dot)gmail.com for educational, club and reseller quantities and pricing. Would be useful if I added an ASCII command mode to RoboPi so people could control it with minicom or other serial terminal software? The major advantage would be users easily being able to use RoboPi with languages other than C/C++ and Python. 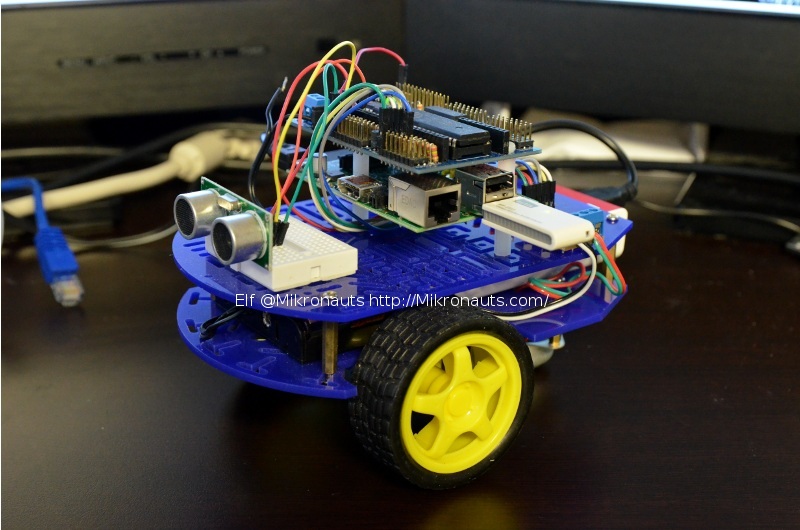 See http://www.mikronauts.com/robot-zoo/elf-2wd-pi-robot/ for a RoboPi + Raspberry Pi based sample robot. 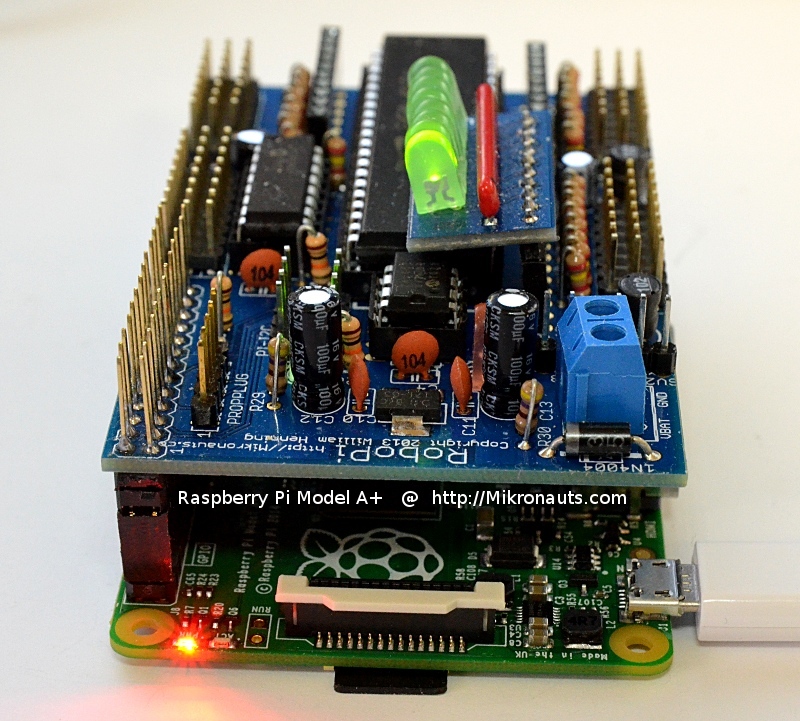 Also the propeller chip, is a fantastic combination with RPI. Probably you are aware that Peter Jakacki and Parallax of course, announced the Propeller 2.
the RPI, in many different flavours, but the most successful probably would be Gforth. I have done a video how to install Gforth on the PI using Wiring-pi libraries with Gforth. Probably you would like to assist. I have started working on the next firmware revision, and I welcome suggestions for what additional software features you would like to see.